LoRaWAN has recently emerged as one of the key radio technologies to address the challenges of Low Power Wide Area Network (LPWAN) deployments, namely power efficiency, long range, scalable deployments, and cost-effectiveness. The LoRa Alliance has had an exponential growth with 500+ members with the recent arrival of heavyweight members such as Google, Alibaba, and Tencent joining the alliance. The first wave of LoRaWAN was primarily focused on large country-wide deployments led by operators such as KPN, Orange, Swisscom and many more. However, the next wave that is already coming is the arrival of private LoRaWAN deployments from large enterprises and enabling roaming for inter-connection amongst public/private networks (esp. for use cases which involve LPWAN Geolocation  ]). 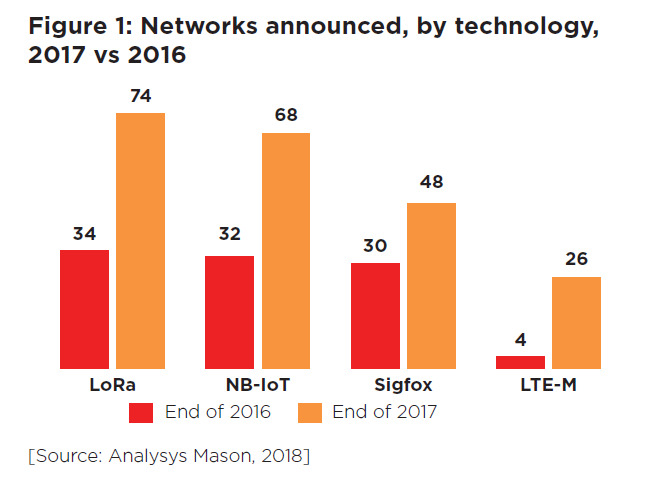 As the IoT deployments grow in both the densification and geographical footprint, it is inevitable that network design becomes one of the important factors ensuring long-term success and profitability of both operators and end-customers relying on LoRaWAN connectivity for their IoT use cases. A typical example is the recent 3 million water meter contract awarded by Veolia Birdz to Orange : such large-scale projects require careful network planning to achieve the required densification and quality of service while optimizing costs. LoRaWAN deployments use a star topology with a frequency reuse factor of 1 which allows simplicity in network deployment and ongoing densification: there is no need for frequency pattern planning or reshuffling as more gateways are added to the infrastructure. Compared to mesh technologies, the single hop to network infrastructure minimizes power consumption as nodes do not need to relay communication from other nodes. Another advantage is that gradual initial network deployment in sparse mode with low node density is possible, compared to mesh which requires minimum node density to operate. Even more importantly, LoRaWAN is immune from the exponential packet loss suffered by multi-hop RF mesh technologies in presence of increasing interferers and noise floor power. Another unique feature of LoRaWAN networks is that messages in uplink can be received by any gateway (Rx macro-diversity), and it is the function of a network server to remove duplicates in uplink and select the best gateway for downlink transmission based on the uplink RSSI estimates. This allows enabling of features such as geolocation to be easily built into LoRaWAN deployment and enables uplink macro-diversity that significantly improves network capacity and QoS (Quality of Service). LoRaWAN also supports features such as Adaptive Data Rate (ADR) that allows network server to dynamically change parameters of end-devices such as transmit power, frequency and spreading factor via downlink MAC commands. Optimization of theses settings is key to increase the capacity and reduce the power consumption of end-devices. The optimization of LoRaWAN parameters along with densification can lead massive amounts of capacity increase in the network. In fact, the LoRaWAN capacity of the network can scale almost indefinitely with densification. How does densification lead to lower TCO for Enterprise deployment? 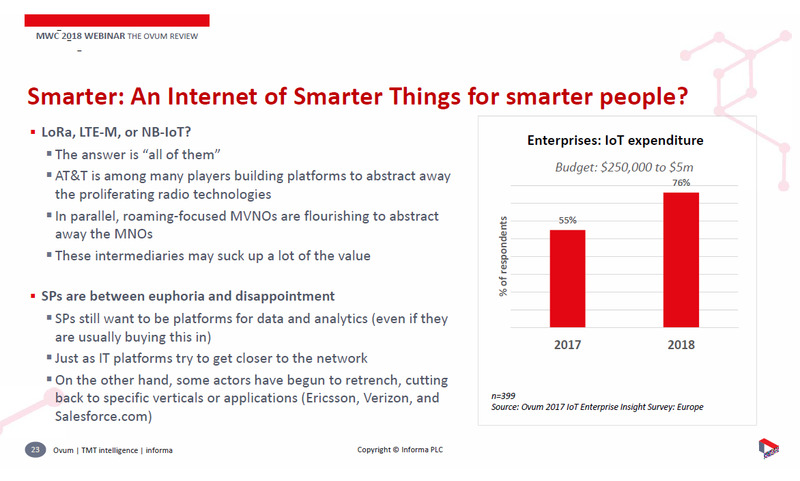 As the network is densified by deploying more LoRaWAN Gateways and adaptive data rate and power control algorithms are applied intelligently in the network, this leads in dramatic reduction of power consumption of end-device and thus reduction in Total Cost of Ownership (TCO) of end devices. The figures below show clearly that densification can lead to upto 10X savings in both power consumption and overall reduction in 10-year TCO for enterprise deployment. Changing the batteries require manual labor and is the cost that can significantly dominate 10-year TCO of large-scale enterprise deployment (for ex. Smart gas/water meters). 1. Public Operator Network: In this traditional model, the operator invests in a regional or nation-wide network and sells connectivity services to its customers. 2. Private/Enterprise Network: In this model, enterprise customers typically setup LoRaWAN gateways on private premises (e.g. an airport), and either have these gateways managed by an operator, or use their own LoRaWAN network platform. This mode of deployment is a game changer for dense device use cases, as network capacity and enhanced QoS can be provided at marginal increased cost. It becomes possible because LoRaWAN runs in unlicensed spectrum and gateways are quite inexpensive and easy to deploy. 3. Hybrid model: This is the most interesting model that LoRaWAN allows due to its open architecture. This is not possible or rather difficult in other competing LPWA technologies or Cellular IoT (due to licensed spectrum and absence of roaming/peering model between private and public networks). There are initiatives like CBRS and MulteFire from 3GPP Players but they are still in progress and far from maturity for large scale IoT deployments (esp. for use cases that demand 10-15 years+ battery lifetime). In hybrid model, operator provides light country-wide outdoor coverage, but different stakeholders such as private enterprises or individuals help in densifying the network further based on their needs on their premises, via managed networks. This model enables a win-win private/public partnership in sharing the costs and revenues from the network and densify the network where the applications and devices are most present. This model is possible because multiple gateways can receive LoRaWAN messages and network server removes duplication. In the cases where different operators/enterprises run their networks, LoRa Alliance already has approved roaming architecture in “LoRaWAN Backend Interfaces 1.0 Specification”   to enable network collaboration. This model significantly reduces the operator investment and offers a disruptive business model to build IoT capacity where it is mostly needed. When designing and deploying a LoRaWAN network, the system operator must balance the cost of a dense network (and it's served sensors) against the cost of a sparse network (and it's served sensors). In the traditional deployment model, the operator deploys LoRaWAN gateways on telecom towers. This entails leasing the space from the tower owner, purchasing a waterproof outdoor gateway, climbing the tower to hang the gateway, and perhaps paying for additional power, zoning, permitting, and backhaul. The operator does the detailed RF propagation study and hangs enough gateways to provide coverage for the sensor locations required to provide the services he wants to provide. Another option is to opportunistically deploy “femto” gateways in devices that the operator is already fielding. The gateways are stateless, and thus do not add much complexity to the hosting device. An 8-channel LoRaWAN reference design is mated to the host device using either USB or I2C. The options here are quite diverse. The operator can embed a simple 8 channel gateway into ongoing WiFi hotspots, power supplies, amplifiers, cable modems, thermostats, virtual assistants, or any mass-produced device that already has backhaul. The Bill of Materials adder is quite modest, the power consumption and heat dissipation are less than 3 Watts, and the size delta is roughly 7 cm by 3 cm. Calculating the number of opportunistic gateways to provide adequate coverage for a given deployment can be challenging. The height of the gateways has a large impact on the coverage of the gateway. A gateway deployed in a 20th story of an apartment building has a much better coverage pattern than the same gateway deployed in the basement of a single-family home. Gateways deployed in WiFi hotspots mounted on power poles have a different coverage area than a gateway deployed on light poles. So, the actual number of gateways deployed in each scenario varies widely. When you complete the detailed design of each network type, you typically find that an opportunistic deployment model allows the operator to cover a given area by deploying roughly 100 times as many gateways for roughly 1/10th of the cost (when compared to the traditional 3rd party leased tower model). For the rest of this analysis, we will assume that the operator needs to deploy a LoRaWAN network to service 100K water meters. Water meters represent a difficult RF propagation model. They are installed at or below ground level, must last 20 years, and suburban meters tend to have accumulations of grass and dirt collect over time. Let’s assume a North American deployment model, and we have the option of using a high power (27dBm) or a low power (17dBm) meter. One possible design is to use a tower-based approach. In a tower-based approach, the operator typically ends up deploying high power water meters in order to reduce the number of (expensive) tower leases. In order to run at high power, the North American regulations require the sensor to send across 50+ channels, which drives the operator to deploy 64 channel gateways. Let’s assume that the average distance between a water meter and a tower-based gateway is ~3km and the sensors need to send one reading per day. Many of the meters thus operate at SF10 at 27dBm. The sensor designer includes a high-power RF amplifier, calculates the energy requirements over the life of the sensor, and sizes the battery appropriately. Another possible design is to opportunistically deploy thousands of femto gateways into the area. The question boils down to “How many femto gateways do I need to cover the desired area?”. Working backwards from the densest possible deployment, most MSOs (Multiple-System Operator) serve 1/3 of the households in their footprint. In many urban environments, the average distance between a given operator’s subscribers is 30 meters. If such an operator could opportunistically deploy in most of those sites, they would have inter-gateway distances as small as 30 meters. For the purposes of this analysis, let’s say that the average distance between the sensor and the closest gateway is reduced from 3000 meters to 100 meters. When a sensor is 100 meters from a gateway, it can typically operate at SF7 at 17dBm (or lower). Clearly, the network designer must account for a distribution of distances between a given sensor and its closest gateway, but the overall power savings is significant. 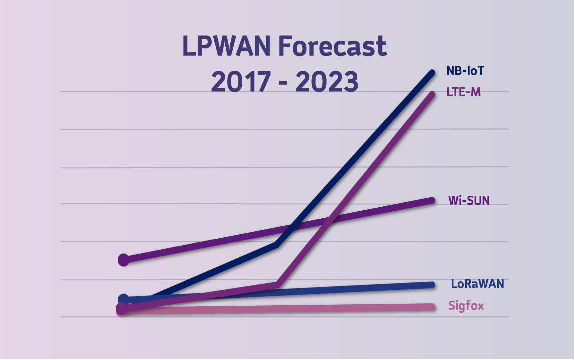 It is also instructive to compare the overall capacity of a tower-based LoRaWAN network to the overall capacity of the opportunistic LoRaWAN network. Remembering that 100 eight channel opportunistic gateways cost about 1/10th of a single 64 channel gateway, we realize that we get ~13 times as much network capacity for 1/10th of the cost. As the sensor density increases, we could deploy additional opportunistic gateways and get ~130 times as much network capacity for the same cost as a tower-based network. When we compare the cost to build a sensor designed to last 20 years using SF10 at 27dBm to the cost to build a sensor designed to last 20 years using SF7 at 17dBm, we find that we can save more than $10 per sensor by deploying the denser network. So, in addition to saving a significant amount of capital by opportunistically deploying the gateways, the operator can save more than $10 per water meter by opportunistically deploying a dense network. This saves more than $1M on the 100K water meter deployment. 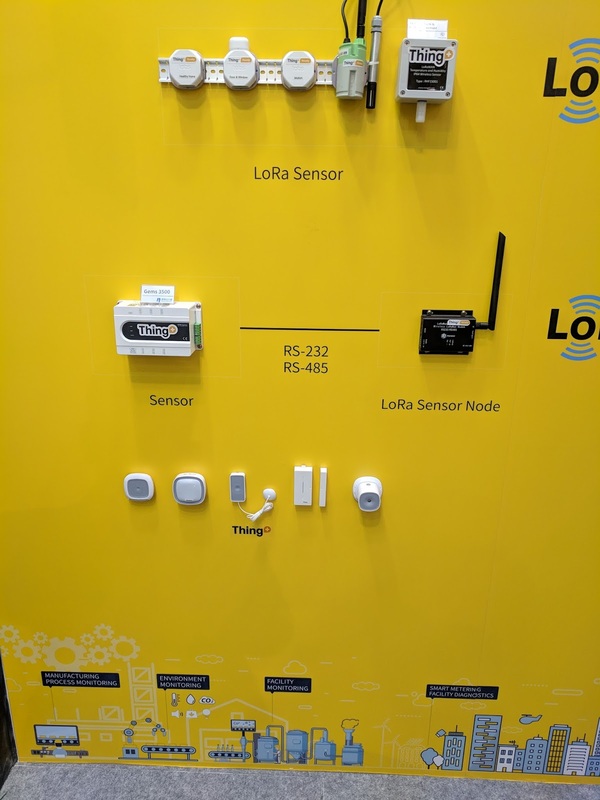 When one layers in additional use cases, the dense LoRaWAN network provides sensor savings on each additional set of sensors. Most of the sensors do not have the 20 years requirement and thus do not save the same amount of money, but batteries are one of the primary drivers for any sensor’s cost. This analysis is somewhat simplified, and a very large-scale deployment may require a certain amount of traditional gateway placement to provide an “umbrella” of coverage that is then densified using opportunistic methods. By densifying the network, the overall sensor power budget is decreased significantly. One could also envision a deployment model in which an opportunistic gateway is deployed in conjunction with a set of services. The operator would add IoT based services to an existing bundle (let’s say voice/video/data, thermostat control or personal assistant) and know that the sensors would be co-resident with the gateway. What is the future of LoRaWAN? LoRaWAN exhibits significant capacity gains and massive reduction in power consumption and TCO when ADR algorithms are used intelligently in the network. We showed how LoRaWAN networks are deployed for coverage and how network capacity can be scaled gracefully by adding more gateways. There are already 16 channels in EU, but there have been recent modifications of the regulatory framework to relax the spectrum requirements and increase transmit power, duty cycle and number of channels . The above LoRaWAN features and upcoming changes to EU regulations will allow significantly scaling of unlicensed LoRaWAN deployments for years to come to meet the needs of IoT applications and use cases. LoRaWAN capacity depends indeed on the regional and morphology parameters. As we have showed in the above results, if the network is deployed carefully and advanced algorithms such as ADR are used, there can be dramatic increase in network capacity and massive reduction in TCO. This will be one of the main factors that will determine the success of LoRaWAN deployments as the demands and breadth of IoT applications scale in future. We also showed earlier how LoRaWAN offers innovative public/private deployment model in which operators can build capacity incrementally and supplement with extra capacity by leveraging gateways deployed from private individuals/enterprises. Typically, for cellular networks there can be anywhere from 5-10% IoT devices on cell-edge which are in outage . This applies especially to deep indoor nodes (for example, smart meters with additional 30 dB penetration loss). Such nodes can only be covered by densification of cellular network which is expensive considering it is being done only for 5-10% of IoT devices. One way to address this problem is deploying private LoRaWAN on cell-edge and using multi-technology IoT platform that combines both LoRaWAN and Cellular IoT . On the other hand, LoRaWAN offers a cost-effective way to augment network capacity where it's needed most. LoRaWAN gateways are very cost-effective and can be deployed using Ethernet/3G/4G backhaul with minimal investment in comparison to 3GPP small cells. This allows building IoT network in cost-effective manner and scale it progressively based on the application needs. We believe that his deployment model has dramatic effect on ROI for IoT connectivity based on LoRaWAN. 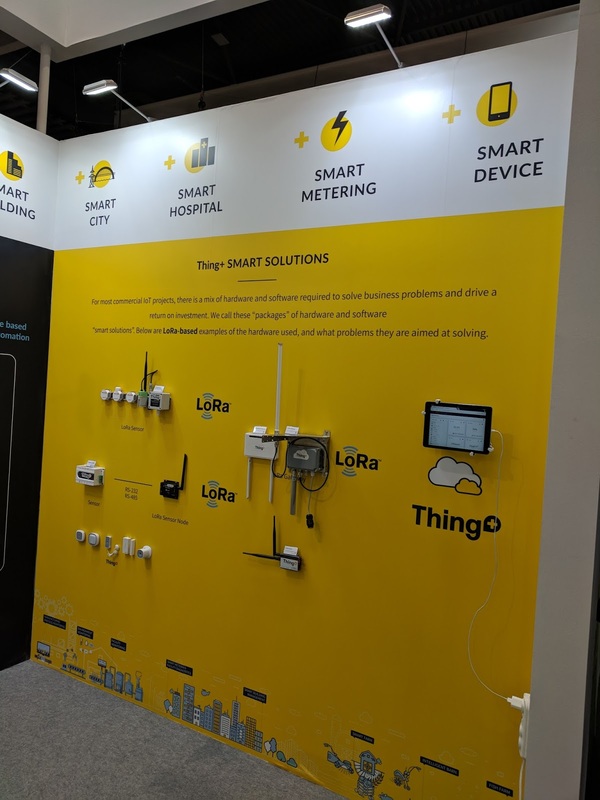 The LoRa Alliance has standardized the roaming feature, which enables multiple LoRaWAN networks to collaboratively serve IoT devices. Macro-diversity used across deployments enables operators/enterprises to jointly densify their networks, hence providing better coverage at lower costs. 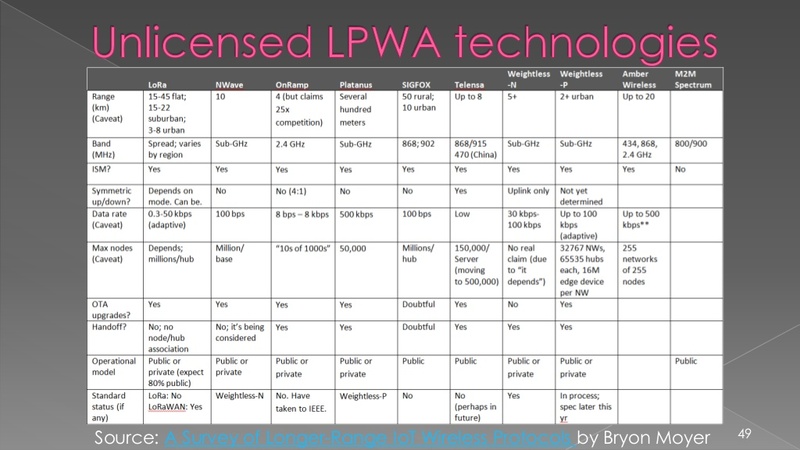 The future of LoRaWAN as shown below will be private/enterprise network deployments and disruptive business models through roaming with the public networks    . Actility webinar slides: Designing a LoRaWAN Network for Dense Deployment, https://www.slideshare.net/Actility/designing-lorawan-for-dense-iot-deployments-webinar. In the big world of IoT, location tracking is the next frontier!. Location tracking for humans is already an integral part of our lives especially for navigation. Traditional technologies enabling this are not only expensive, they have technical boundaries preventing scaling. For IoT geolocation to become a true reality, it is inevitable it has to be extremely accurate, extremely low cost, and extremely low touch. Research and Markets predict revenues from Geo IoT will reach $49 billion by 2021. The above applications represent large existing market which can be only be enabled with extremely low cost and low power trackers. This is the reason why LPWAN-enabled geolocation is in fact a separate product category for large existing market. Railway cars, truck trailers, containers: tracking valuable assets on the move is a pain point for most large distributed organizations involved in logistics and supply chain, typically relying on partners such as distributors to correctly register check-in and check-out events. This registration process at specific checkpoints is usually manual, intermittent and subject to human errors. To tackle this issue, an IoT low power asset tracking system using LPWAN (Low Power Wide Area Network) trackers brings a “timeless” checkpoint solution. Specifically, LoRaWAN™-based trackers, because of their low power, low cost and lightweight infrastructure, provide a first truly reliable tracking solution allowing to reduce downtime during transportation. In the logistics sector, many business cases involve additional costs due to inefficient utilization of assets. Transport companies need to invest in freight railway cars, car logistics companies need to invest in truck trailers, and of course there are the standard containers and pallets. However, measuring this downtime is also a challenge. Traditional solutions involved cellular or satellite trackers, which require significant CAPEX, but perhaps more importantly also ongoing OPEX due to battery replacements and connectivity costs. In some cases, trackers are located in hard to reach areas especially when mounted on railroad cars, or in oil and gas rigs, which makes it very costly to replace batteries especially if there are several hundreds of thousands of trackers deployed in the field. The battery replacement is done by humans and is one of the dominating OPEX factors in overall Total Cost of Ownership ( TCO) of the whole solution. These replacement costs actually made it difficult to justify the mass adoption of conventional geolocation solutions in the logistics sector. LoRaWAN is LPWAN connectivity standard developed by LoRa Alliance primarily for unlicensed ISM spectrum, to create disruption in both the technology and business models. On the technology front, the main impact is on drastic reduction of power consumption, which reduces battery usage and ultimately also OPEX related to ongoing maintenance. It also creates new opportunities for more dynamic tracking, as communication events are less costly. On the business model side, logistics companies can now trade off between CAPEX and OPEX: most LPWAN systems operate on an unlicensed band, for example the leading LoRaWAN™ technology operates in the 915MHz band in the US, the 868MHz band in Europe and equivalent ISM bands in other parts of the world. This means that logistics companies can invest in their own wireless networks to reduce or eliminate variable connectivity costs. The potential of LPWAN-enabled tracking requires a new generation of hardware. The lower radio frequency power consumption is only a part of a massive effort to decrease overall power consumption of the whole system. This requires developing a multi-technology geolocation tracker platform that can combine GPS, Low-Power GPS, WiFi Sniffing, WiFi fingerprinting and Bluetooth with the goal of reducing power consumption and provide location information opportunistically in variety of scenarios such as (indoor/outdoor, urban/rural, slow/fast moving and so on). Another key factor is the usage of LPWAN technologies such as (LoRaWAN, NB-IoT, LTE-M) for transporting geolocation data back to the cloud. This is the key as traditional cellular technologies such as 2G/3G/4G are just too power hungry to meet the target goal of 5-10 year battery lifetime. However, there will be licensed Cellular IoT options based on NB-IoT/LTE-M that will be also be used for some of the applications. The next frontier in IoT geolocation will be two fold. The first will be the multi-technology cloud platform that will combine intelligently Over-The-Top (OTT) geolocation technologies such as GPS, Low-Power GPS, WiFi and Bluetooth with network based TDoA geolocation technologies using LoRaWAN and/or Cellular. This requires close cooperation between public network operators with geolocation service providers. In order to shed some light on the above mentioned points, we are hosting a webinar that explains where we will explore the challenges of network-based geolocation and how it can be combined with other geolocation technologies such as GPS, WiFi and Bluetooth. We will explain how multi-technology geolocation differs from traditional cellular+GPS based geolocation, and show how it opens up an entirely new market and product category. We’ll also explore how multi-technology geolocation meets the requirements and use cases for connecting small sensors which are low-cost with very long battery lifetime. A guest speaker from KPN will share selected case studies demonstrating IoT geolocation deployments and discuss real-world experience. The webinar will conclude with outlook for technological evolution in the field, and give an overview of our Location portfolio. What are the market opportunities and use cases enabled by IoT Geolocation? What are the benefits of multi-technology geolocation? 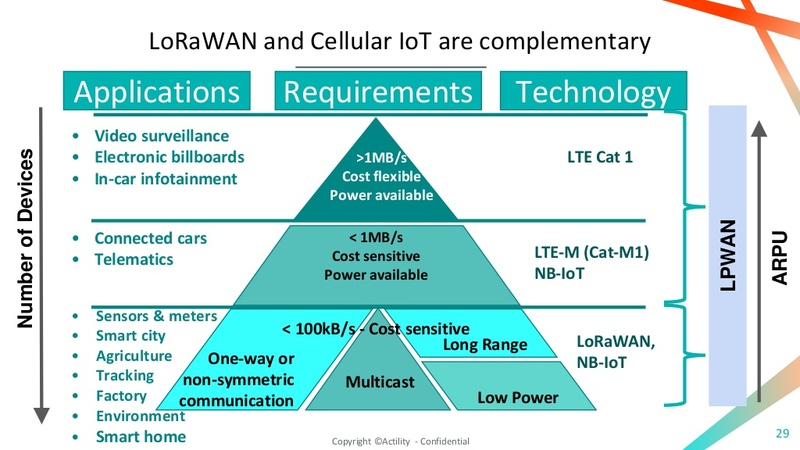 What are the benefits of using LPWAN technologies(LoRaWAN, NB-IoT, LTE-M) for connectivity? How LPWAN-enabled Geolocation will evolve in the future? How is Actility building multi-technology geolocation platform? 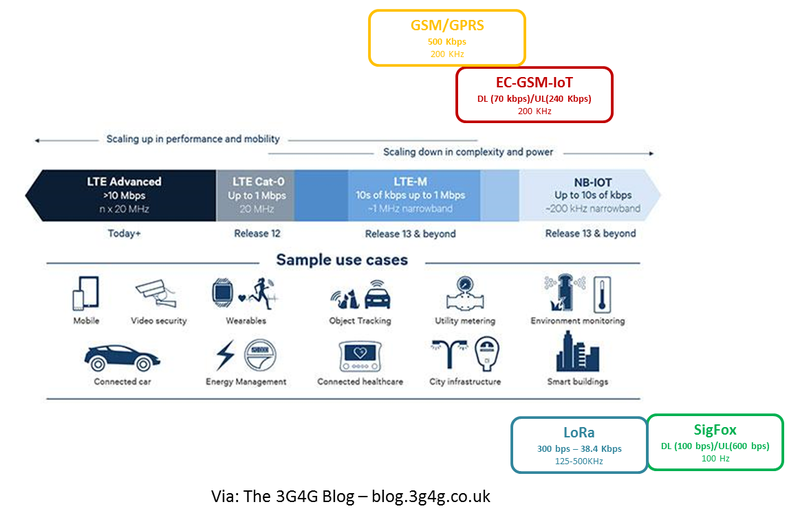 Cellular IoT (CIoT) or LoRa? Back in September, 3GPP reached a decision to standardise NarrowBand IOT (NB-IOT). 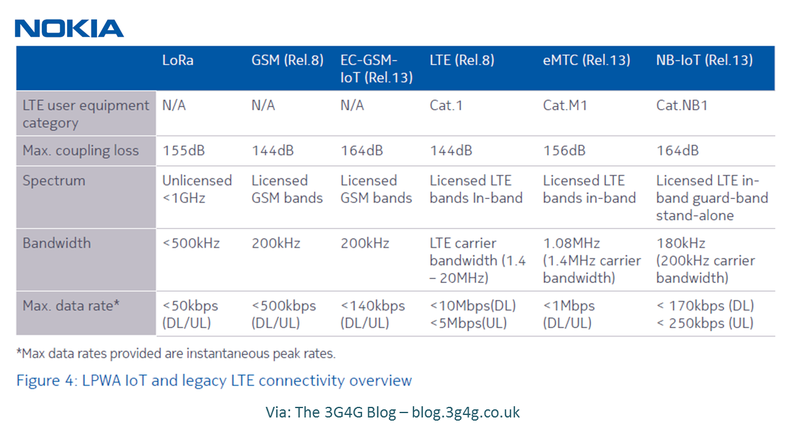 Now people familiar with the evolution of LTE-A UE categories may be a bit surprised with this. Upto Release-11, the lowest data rate device was UE Cat-1, which could do 10Mbps in DL and 5Mbps in UL. This was power hungry and not really that useful for low data rate sensor devices. Then we got Cat-0 as part of Release-12 which simplified the design and have 1Mbps in DL & UL. ‘In-band operation’ utilizing resource blocks within a normal LTE carrier. 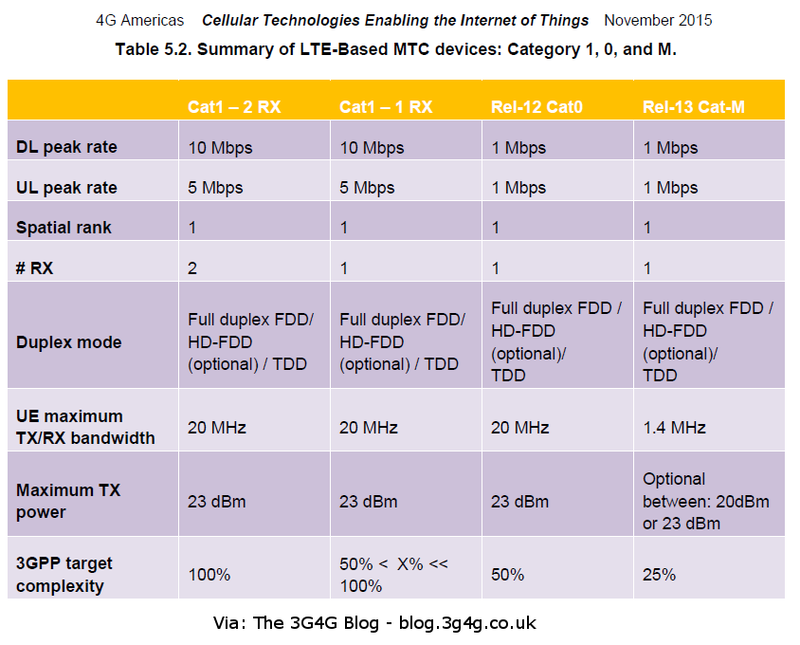 LTE-M: 3GPP RAN is developing LTE-Machine-to-Machine (LTE-M) specifications for supporting LTE-based low cost CIoT in Rel-12 (Low-Cost MTC) with further enhancements planned for Rel-13 (LTE eMTC). LTE-M supports data rates of up to 1 Mbps with lower device cost and power consumption and enhanced coverage and capacity on the existing LTE carrier. EC-GSM: In the 3GPP GERAN #62 study item “Cellular System Support for Ultra Low Complexity and Low Throughput Internet of Things”, narrowband (200 kHz) CIoT solutions for migration of existing GSM carriers sought to enhance coverage by 20 dB compared to legacy GPRS, and achieve a ten year battery life for devices that were also cost efficient. Performance objectives included improved indoor coverage, support for massive numbers of low-throughput devices, reduced device complexity, improved power efficiency and latency. Extended Coverage GSM (EC-GSM) was fully compliant with all five performance objectives according to the August 2015 TSG GERAN #67 meeting report. GERAN will continue with EC-GSM as a work item within GERAN with the expectation that standards will be frozen by March 2016. This solution necessarily requires a GSM network. NB-LTE: In August 2015, work began in 3GPP RAN Rel-13 on a new narrowband radio access solution also termed as Clean Slate CIoT. 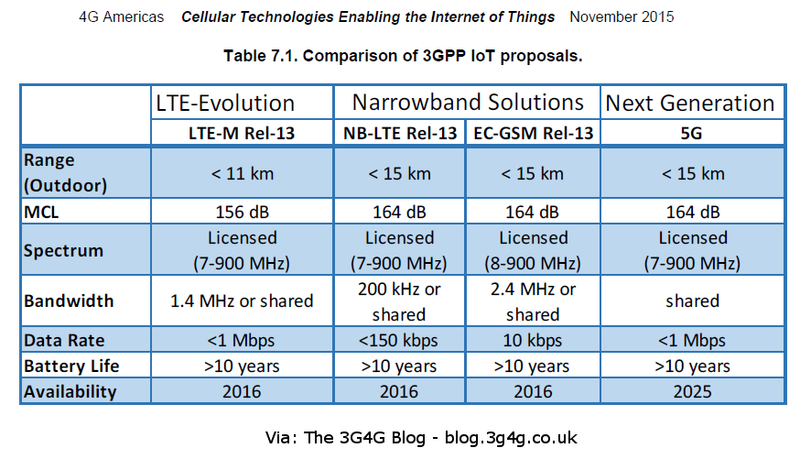 The Clean Slate approach covers the Narrowband Cellular IoT (NB-CIoT), which was the only one of six proposed Clean Slate technologies compliant against a set of performance objectives (as noted previously) in the TSG GERAN #67 meeting report and will be part of Rel-13 to be frozen in March 2016. Also contending in the standards is Narrowband LTE Evolution (NB-LTE) which has the advantage of easy deployment across existing LTE networks. Rel-12 introduces important improvements for M2M like lower device cost and longer battery life. Further improvements for M2M are envisioned in Rel-13 such as enhanced coverage, lower device cost and longer battery life. The narrowband CIoT solutions also aim to provide lower cost and device power consumption and better coverage; however, they will also have reduced data rates. 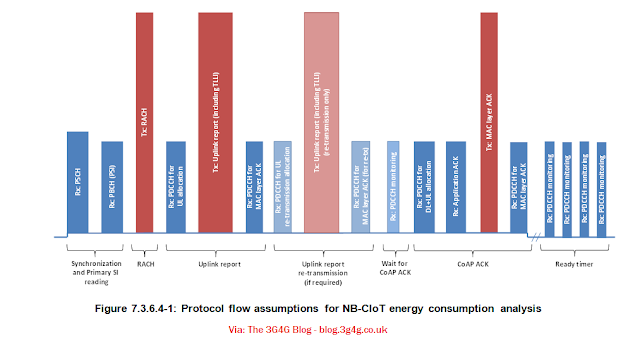 NB CleanSlate CIoT is expected to support data rates of 160bps with extended coverage. Table 7.1 provides some comparison of the three options to be standardized, as well as the 5G option, and shows when each release is expected to be finalized. In the past few weeks, the announcements have been ramping up. Semtech (the creator of the LoRa protocol itself, and the key IP owner) has been most active, announcing that The Lace Company, a wireless operator, has deployed LoRa network architecture in over a dozen Russian cities, claiming to cover 30m people over 9,000km2. Lace is currently aiming at building out Russian coverage, but will be able to communicate to other LoRa devices over the LoRa cloud, as the messages are managed on cloud servers once they have been transmitted from end-device to base unit via LoRaWAN. But the biggest recent LoRa news is that Orange has committed itself to a national French network rollout, following an investment in key LoRa player Actility. Orange has previously trialed a LoRa network in Grenoble, and has said that it opted for LoRa over Sigfox thanks to its more open ecosystem – although it’s worth clarifying here that Semtech still gets a royalty on every LoRa chip that’s made, and will continue to do so until it chooses not to or instead donates the IP to the non-profit LoRa Alliance itself. It would be interesting to see if this LoRa vs CIoT ends up the same way as WiMAX vs LTE or not.